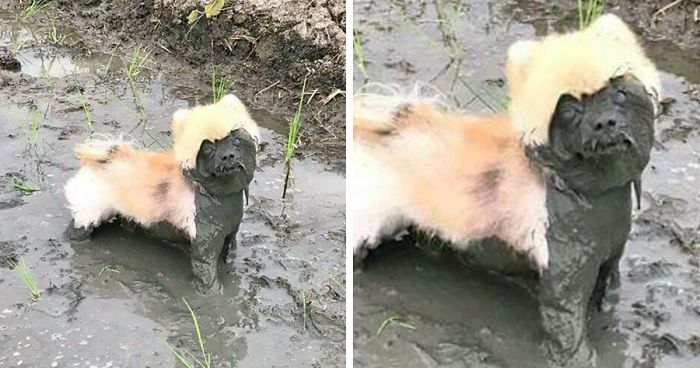 Dogs are supposed to be man's best friend, but it looks like these pups have gotten it wrong, because as you can see from this hilarious list compiled by Bored Panda, these guys aren't man's best friend - they're MUD'S best friend! From mud-painted pugs and dirt-caked corgis to stinky sheepdogs and grubby German Shepherds, these mucky mutts will make you smile, unless you have to give them all a ride home that is! Do you have a dog that loves nothing more than rolling around in the dirt? Then add your pictures to the list, and don't forget to vote for the muckiest pup! omg I love this. That looks like the happiest frenchie. "im gonna be in so much trouble..."
#5 Can You Guess Which Dog Knows What The Word "Bath" Means? #8 Little One Got Stuck In Ditch, Big One Went In To Retrieve Him. No Pup Left Behind! What breed is this?? It's beautiful! Daddy mommy! We did it again! #17 The White Dog Finds The Deepest Muddiest Puddle She Can Find And Walks Straight In! He knows how to keep you at home! "I tried to make the most of those five minutes you gave me....you should see what I can do with 60!" #24 That's One Dirty Mischievous Pupper.. And He Knows It! that face just says "eheheheheh no regrets"
This dog is absolutely beautiful, even if its covered in mud! What a pretty baby!! His face is like "Uh, it's not what you think!" Wow! This dog's eyes are gorgeous. Here comes the fearless raceing hound, rounding the last corner into the home stretch. The crowd roars -"yyyeeeaaahhh". A quick glance over my shoulder shows no one on my heels. They're chanting, "Go, Muffin. Go!" Ha ha! The race is mine! I've won the title- Champion, Dogdom's fastest runner. -- I always knew I was born to win. If face is like "Huehuehuehue"
#37 My Dog Likes To Wear Stockings.... Of Mud! Hi, wanna come outside and play? What a beauty, even with the mud! I love this kind of dog what is it called? They did right by you, letting you just let loose and monster out! But, Becky, you knew I was all dog when you brought me home. Oh, for cryin' out loud. I heard you the first time. I didn't Want to come inside for a bath. Mud slug in a mud bath. Only way to cool off on a summer day - mud bath. Bedt mud so far this year. I'm on a roll. Uh, why am I in trouble again? I was just chasing a squirrel. #51 Current Mood . .
#52 Nothing Like A Good Mud Bath! Squirrel. Mud. Squirrel. Mud. -This is the life! Nuthin but fun every where I look. #53 Daddy Says I Am Walking Home... I Can't Think Why? #54 Casual Walk In The Woods, Not When There Is A Mud Bath Waiting For Me! People Pay For These In Spa's! Do you like my beard and matching boots? Stripes of mud, how artsy! Always wanted to be a black ops Marine Core dog. I can just hear what mom is going to say about this. "Abby! I just took you to thr groomer, and now - This!" #61 I Got In Trouble For This. Not Him. How Unfair Is That. Let me guess: You husband. Him smoochie face doggie. Makes perfect sense to me! #63 There Were Some Weeds In Your New Flower Bed Mom. Got 'em. : ) Daisy picked all your daisies. High-light are back in style. What do ya think of my new look? #65 I Love Rain, Mud, My Doggie Door, And The White Carpet! Aa-roooo! I always wondered how it felt to be a wolf; totally wild and carefree. Please explain to me; why are mud baths are not ok, but water baths are? Here's Ranger trying to blend in with the shadows from the trees again. #72 Has Anyone Seen Our Mutts? These Two Chocolate Labs Showed Up Instead. Your gardening assistant is super cute and looks to be very helpful too! Showing off some of Happy's best work. Gotta remember the way to that place, for sure.